There have been many estimates for when the earth's inner core was formed, but scientists from the University of Liverpool have used new data which indicates that the Earth's inner core was formed 1 - 1.5 billion years ago as it "froze" from the surrounding molten iron outer core. In a new study published in Nature, researchers from the University's School of Environmental Sciences analysed magnetic records from ancient igneous rocks and found that there was a sharp increase in the strength of the Earth's magnetic field between 1 and 1.5 billion years ago. This increased magnetic field is a likely indication of the first occurrence of solid iron at Earth's centre and the point in Earth's history at which the solid inner core first started to "freeze" out from the cooling molten outer core. Liverpool palaeomagnetism expert and the study's lead author, Dr Andy Biggin, said: "This finding could change our understanding of the Earth's interior and its history." 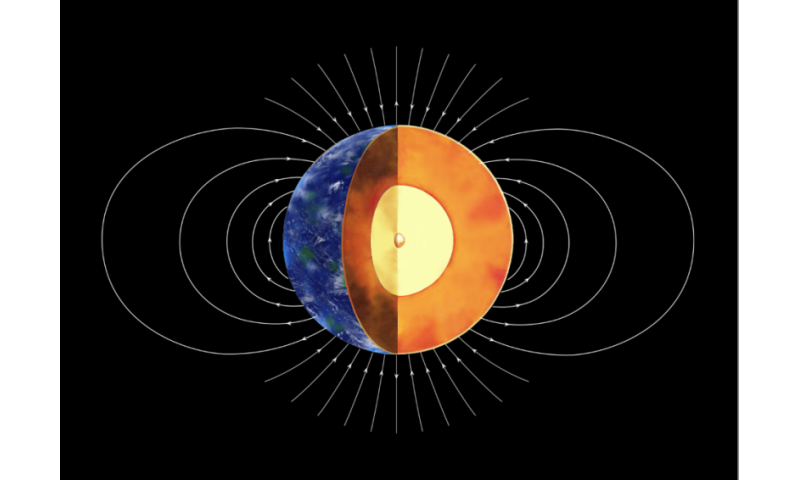 "The timing of the first appearance of solid iron or "nucleation" of the inner core is highly controversial but is crucial for determining the properties and history of the Earth's interior and has strong implications for how the Earth's magnetic field - which acts as a shield against harmful radiation from the sun, as well as a useful navigational aid - is generated. "The results suggest that the Earth's core is cooling down less quickly than previously thought which has implications for the whole of Earth Sciences. It also suggests an average growth rate of the solid inner core of approximately 1mm per year which affects our understanding of the Earth's magnetic field." The Earth's magnetic field is generated by the motion of the liquid iron alloy in the outer core, approximately 3,000 km beneath the Earth's crust. These motions occur because the core is losing heat to the overlying solid mantle that extends up to the crust on which we live producing the phenomenon of convection. Once the inner core started to freeze, this convection received a strong boost in power because light, non-metallic elements remained molten in the outer core and were buoyant relative to the overlying liquid. The process continues today and is thought to be the main source of "fuel" for generating the Earth's magnetic field. Dr Biggin added: "The theoretical model which best fits our data indicates that the core is losing heat more slowly than at any point in the last 4.5 billion years and that this flow of energy should keep the Earth's magnetic field going for another billion years or more. "This contrasts sharply with Mars which had a strong magnetic field early in its history which then appears to have died after half a billion years." "The inner core is Earth's deepest layer. It is a ball of solid iron just larger than Pluto which is surrounded by a liquid outer core. The inner core is a relatively recent addition to our planet and establishing when it was formed is a topic of vigorous scientific debate with estimates ranging from 0.5 billion to 2 billion years ago." We don't KNOW this, it is theory, Not a fact. There are no facts in existence and the only fact is that there are no facts. Exactly as quantum function states: it is a paradox, a duality. For example, the theories of electrical and magnetic function are now generally based on dealing with solids, not liquids. Liquids exhibit far more complex multi-field multi vectored behavior compared to that of a spinning solid. Fundamentally, no one will ever explain gravity by calling the earth's core a solid. Furthermore, the electrons that produce the aurora eventually make contact with the GD and generate an intense magnetic field around the plasma. Coupled with pressure, a factor aiding fusion, which at this depth is 21.1 million tons per square centimeter (136.1 million tons/sq. in. ), would make the hydrogen-rich plasma core yield characteristics that would cause the observed earthquake-wave behavior. This interpretation is especially evident when we consider the recent observations that earthquake waves travel faster north-south than east-west, which reveals a magnetic field the strength of a star slowing the east-west waves (see the section on plate tectonics in Tome Three for the discussion on this phenomena). What is actually at the core is hydrogen plasma, confined by a magnetic field in a constant state of thermonuclear fusion. @kate - given your theory, calculate the mass of earth and the surface gravity. Two more additions to my already very long ignore list ! Well, seismic waves have a relatively sharp increase in velocity at the inner core - outer core boundary, so you would need to explain that if you have something else in mind. Again, not sure how you are getting seismic waves, as measured, behaving like that in a plasma! And it's all tended to and controlled by the Morlocks? Be careful! The article is about the Earth, not the Sun. Your fusion is only confusion. Do you have a peer reviewed paper to prove this? what about nuclear fusion? isn't the earths pressure and gravity what keeps the core as hot as it is?and the inner core though solid is hotter than the outer core I don't understand this if what they are saying in this article is even possible..
An interesting paper. The data analysis is so-so, and you can easily draw a horisontal line through the magnetic filed strength observations. But of course we know the core is cooling, so we wouldn't expect that. As soon as we fit the expected cooling, which fits nicely with the average of observations, we have to have the ~ 1.3 increase, a near doubling in field strength or a return to early Earth field conditions. @KBK: We know this. The core is an observed fact of rotational behavior, thermal properties, seismic properties and seen in asteroids such as Psyche and Vesta. No other observation fits the constraints. @soos: Seriously? Earth's core is ~ 6000 K and ~ 3*10^11 Pa [ https://en.wikipe...ner_core ], Sun's *surface* is that hot and its core is ~ 2*10^7 K and ~ 3*10^16 Pa [ https://en.wikipe...wiki/Sun ; http://nssdc.gsfc...act.html ]. Fusion requires real high temperatures and pressures. The link on Earth's core goes into the solid state physics of the core: "Iron can be solid at such high temperatures only because its melting temperature increases dramatically at pressures of that magnitude (see the Clausius–Clapeyron relation)." The phase diagram of iron sounds humdrum to me, try follow the phase diagrams and phase transitions of ices in the ice moon oceans! They can have many layers of oceans sandwiched between different phases of water ice. If you are interested in phase transitions of compounds, I recommend studying physical chemistry. Hard but fun! And that magnetic field comes from...where exactly if there's no iron core? Magic? Pshaw. Facts and measurements. Don't go confusing people who like ranting with such trivial stuff. P waves both penetrate and reflect at any boundary. There really is no controversy about this anywhere except in your own head. @Ren: "Because we can not know what is the core of the earth without free samples from there. We can only guess but it is no longer science". Scientists don't guess, they use constraints and test whether they work. Measurement theory 101. In this case we do know this. To repeat myself: "The core is an observed fact of rotational behavior, thermal properties, seismic properties and seen in asteroids such as Psyche and Vesta. No other observation fits the constraints." You obviously do not know even what science is. It is just a deductive practice to find out why something is. Some animals have back bones, some animals don't, if you look far enough back in the fossil record, eventually you stop finding things with back bones. Do from that you can conclude life must change over time. You can test the idea that life changes over time by just comparing fossils and the world around you. The way they tell what the interior of the earth is composed of is by measuring earthquake waves. Earthquakes release a variety of waves, and some of those waves can only pass through certain materials, or they change in some other way. They measure the vibrations from one earth quake at different parts of the globe and from there they can triangulate the boundaries of different matter phases. Uhh ren, I just explained to you how it works, in order to SCIENTIFICALLY fight my point, you have to show some data that shows we have a misunderstanding of how waves propagate through the earth, which is what you're suggesting. You were not created in God's image, God is not retarded. Also technology changes and becomes more complicated over time to fit the needs of people. It's the exact same thing as life evolving based on its environment. You can not believe in the free market and developing technologies and deny evolution, they work under the exact same overall mechanism of things changing over time based on the context of their surroundings. To me your analogy is actually proof of evolution.